Silky Chicken - The BBQ BRETHREN FORUMS. 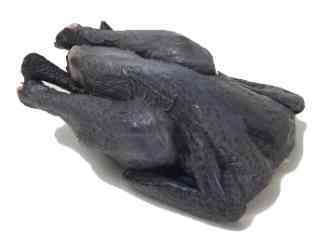 I was in a chinese grocery today and they had purple skinned "silky chickens" for $8.50 each. They're butchered budhist style, which leave the feet and head intact. Supposedly they taste better thean regular chickens. Any one have any experience with these birds? Is it a soup/stew chicken ingredient, the way I constantly see smoked ham hocks as something used to make a base for a bigger dish. My first thought was... " Skin looks crisp !!" Then I realize it's not cooked yet. A co-worker of mine was in the Marine Corps for 15 yrs. We used to carpool together. He used to tell me stories of his 8 yrs living in Japan. He met his wife there and he once mentioned something to me about her family having "black silky chickens". Never knew what they looked like. He never mentioned eating them. I'll have to ask him. He's eaten some strange stuff in Asia. Here's what my seach turned up -(before the kill ?). I'm assuming this is the same bird as your pic as well as what my co-worker was referring to. Go for it Rob !!! You can put it on your authentic 1960's era Japanese kamado Egg. A little terrikayi sauce and you'll be set. Last edited by MilitantSquatter; 08-27-2006 at 06:20 PM..
Is that what lays those thousand year old eggs. I knew a woman from Puerto Rico who raised these for medicinal purposes. She would make a broth or soup out of it. She didn't eat it though, she just inhaled the steam. I forgot about a chicken in the pit that turned out looking like that. call me conservative but regular old chicken tastes pretty good to me. the only thing i eat with purple skin is... well, you know what? i don't eat anything with purple skin! and i wouldn't be eating any birds that might be sliding in from china either, especially now, with the bird flu and all. the only thing i eat with purple skin is... well, you know what? i don't eat anything with purple skin! Those are all pretty good purple-skinned things. aw... you know, i was just having some fun with BQ by getting all regular on his food find. but seriously though Rob, even though i respect your culinary enthusiasum i would pass on this clucker,IMHO. If I looked at that yesterday morning I would have puked tequila.